Easter is just around the corner, and I’m sure my kids aren’t the only ones getting excited to celebrate. Here are two simple Easter bunny crafts that you can do with your kiddos using supplies that you probably already have around the house! These cute bunnies are not only fun to make but a blast for the kids to play with when they are done. My little man is home on spring break this week and I am absolutely loving it. Sleeping in and snuggles in the morning instead of the normal get up and rush to get where we all need to be. Usually by this time we have already done all sorts of Easter related projects and cooked up some cute treats, but not this year. A family road trip and busy schedule have left us very little time to anticipate a very special holiday. Since my son is home, and we always like to stay busy we have spent some time this week getting excited for Easter’s arrival. We put a few decorations, and went to the library to find books that related to Easter, and will be coloring Easter eggs as normal. We are looking forward to visits with family and church this weekend. 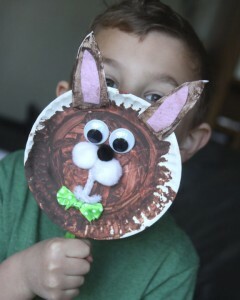 We found a small window of time and a rainy morning this week to make a quick, but super fun Easter bunny craft! This was one of those projects that we came up with that we could make using stuff that we already had in the house. I didn’t want to make an extra trip or spend too much time gathering supplies. We grabbed our trusty craft box (which I think every stay at home mother of toddlers needs) and got geared up to make some hoppy little bunny friends. I got out some small paper plates and had the kids paint them in whatever color they wanted their bunny to be. We then attached ears (which they also painted) using pieces of another plate cut up into “ear” shapes. We added felt to the ears and little bows using ribbon. The boy bunny got a green bow tie while the girl bunny got a pink hair ribbon. Using poms we added little bunny cheeks and noses. 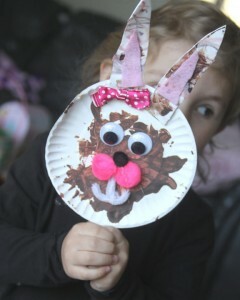 Googly eyes and a pipe cleaner shaped like a mouth were hot glued to the plate to finish off the bunny face. The last step was to add a Popsicle stick to the backside of the plate to turn our bunny faces into an adorable Easter bunny mask. The kids had a great time making these, and are having even more fun hopping around the house playing Easter bunny. They have found a stash of plastic eggs and put little toys in them ,and hide them around the house for each other, pretending that they are the really Easter bunny. 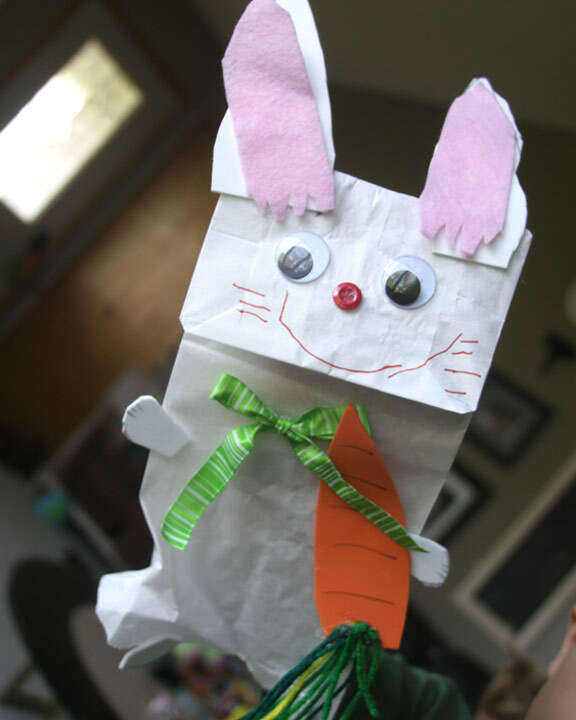 We also made some paper bag bunny puppets that were a ton of fun to create. They turned out really cute and have offered the kids yet another way to play Easter bunny throughout the house. All we did was add googly eyes, a button nose, foam ears, and a whiskery smile to a simple white paper bag to create these. These bunnies are complete with bow ties, a foam carrot with yarn stems, foam bunny feet, and of course, cotton balls for a fluffy white bunny tail. I love having our craft box available filled with all of the goodies to make whatever the kids dream up. Both of these simple crafts were a hit with the kids and have really gotten them excited for the Easter bunny to visit!